Bhajani is a handy multi-grain flour made with roasted grains and pulses. Sometimes, some of the grains are washed before roasting. This pre-processing makes bhajani quick to cook and easier to digest. The whole grains and pulses or lentils ensure plenty of fibre, which also gives the finished products a great grainy texture. There are no fixed ingredients, but rice, wheat, jowar, bajra, raagi and pulses like whole chickpeas, green or black gram, or other lentils or various daals are commonly used. There are no fixed proportions for the ingredients either, but a general rule of thumb is to use more grains than pulses. Bhajani also includes roasted coriander and cumin seeds, which give it a distinct flavour. Bhajani is used to make breads like thalipeeth and dhapatey, or chakalis. 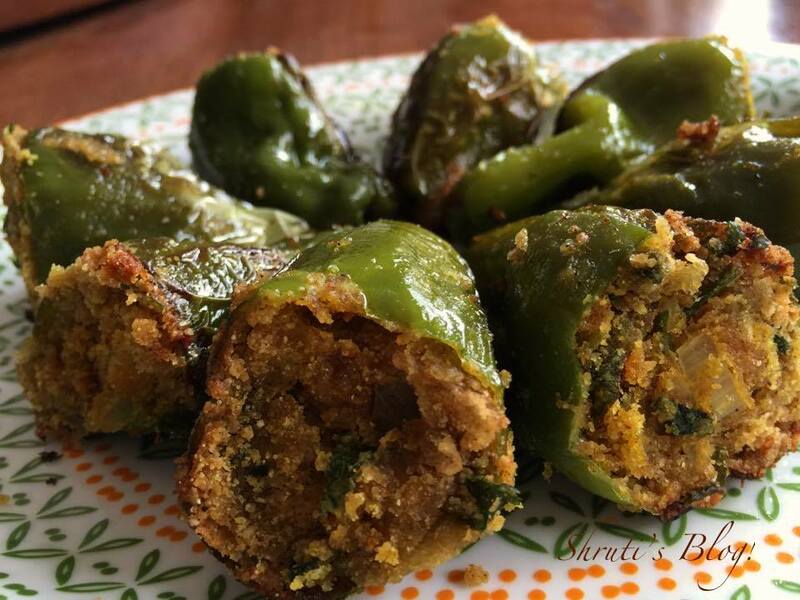 It can be made into mokli bhajani, an upma like dish that is very nutritious and easy to make. It can also be used to stuff all sorts of vegetables like okra, capsicum, snake gourds, tomatoes. In a bowl, mix the chopped onion and sprinkle some salt. Rub the salt into the onions to bring out the moisture. Add the bhajani flour and besan, coriander and cumin powders, haldi and hing. Check and adjust the salt. Add 1 tbsp oil and lightly mix it into a crumbly mixture. There’s no need to add water, as the mixture will cook on the steam and firm up. Wash the capsicums and slice the tops off. Remove all the seeds with a sharp knife. Rub a little oil onto each pepper from the outside and stuff with the crumbly bhajani mixture. Arrange the capsicums on their sides in a heavy bottomed shallow pan and drizzle the rest of the oil on top. Place the pan on the stovetop and cook covered on a very low flame. Turn the capsicums once to ensure even cooking. 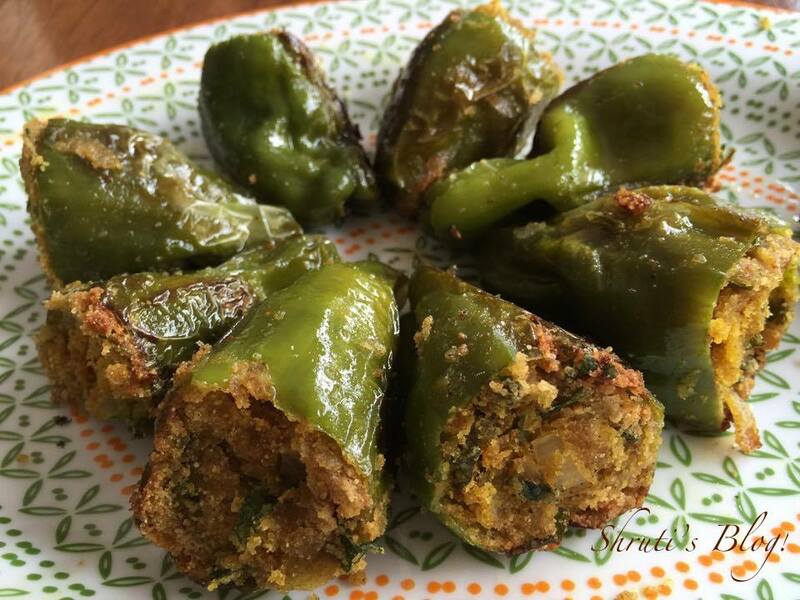 Remove from heat when the capsicum skins are roasted and the stuffing looks cooked. This should take about 10-15 minutes. Alternately, you could try baking the stuffed capsicums in a hot oven for about 15 minutes or until they are done to your liking. You can serve the capsicums warm or at room temperature with any main meal or even as a starter or snack. This bhongi mirchi is so tasty and Awesome!! !Thanks for sharing.